First off, Thank you for inviting me to post on Crazy Good Parent – I’m deeply honored to be associated with such a great blog. We have a round pool. An above ground round pool. It is much, much, much fun. We’ve had these kind of stanchion pools for years now – and having a pool available in the Tucson’s summer heat is most desirable. One of the ‘things’ we like to do in our round pool is creating a whirlpool. Basically, it’s just running or jumping around the perimeter of the pool until you create a whirlpool. It’s even better when we pull the ladder into the middle of the pool, so no one ends up with a huge bruise on their body from ramming into the ladder – because we can accomplish that bruise running into the filter nozzles. When sploosh or splash balls started becoming popular, we added them to the chaos of whirlpooling. Then we started the phenomena of “Sploosh Ball Wars” – which is basically hurling sploosh balls at each other whilst constantly moving around the whirlpool. You have to be 1/4 to 1/2 way away from the person being bombed and no nasty, intentional hits to the face. However, unintentional face hits are totally legal and laughter is allowed. Nothing is done in meanness – it’s all in good fun and makes for great exercise. 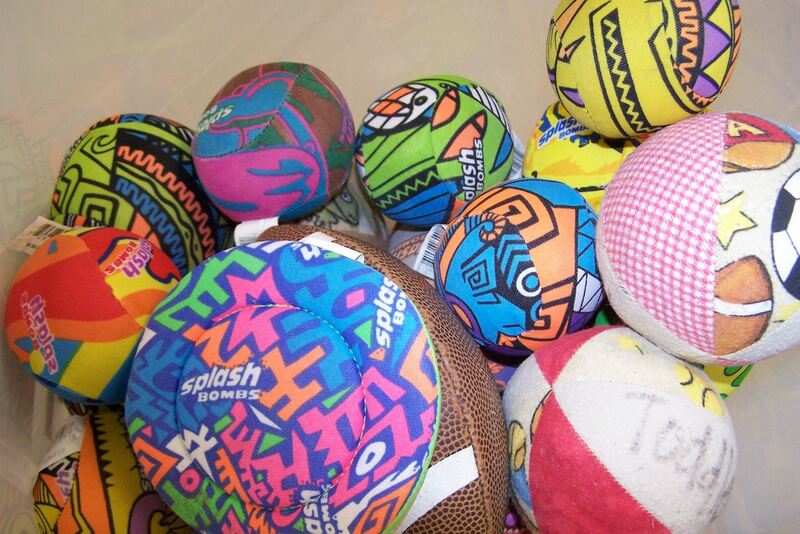 I guarantee that you will have an 8:30PM sleeping kid if you engage in at least 60 minutes of “Sploosh Ball Wars”. But that’s not what I’m really writing about today- what I want to discuss is something interesting that came out of my 11 year old son’s mouth (as opposed to some of the crazy stuff he often says). As we were moving beaning each other with Sploosh Balls yesterday, he said “Mom, this is probably really good therapy”. And after thinking about it – I think I agree. We have gotten to the point in our relationship where we tend to argue a bit – and my son is starting to approach his pre-teen-angst-years and puberty, and is very frustrated that we boss him around. He feels cheated that he cannot boss us around (well, duh, that’s the point!). So we are going to see if semi-daily/daily rounds of Sploosh Ball Wars improves our relationship. I think he’s on to something – there is nothing quite like getting to bean each other (with love and laughter) with Sploosh Balls and getting a lot of good exercise to drain one of negative feelings. Every time we engage in this fun game, we leave the pool with really great attitudes. We feel relaxed and chummy towards each other and I’ve noticed that we do argue less and listen to each other more. Last night, after Sploosh Ball Wars, my son was a bit snippy with me because he was angry at his father – but he came up to me (all on his own) and apologized with a big kiss and then told his father he was sorry and explained his frustrations (in a written letter – which is awesome). Son and father worked it out and the evening was very pleasant for all. So that is the experiment this summer – to see if Sploosh Ball Wars will help ease the road of 11 year old male puberty. I suggest a good pair of sturdy sunglasses, about 20 Sploosh Balls and some noodles. That should put you on the road to summer fun. Oh yes, and a pool – a round pool. I will report periodically throughout the summer on our Sploosh Ball War Therapy. Can this treat pre-teen angst and puberty? I’m banking on it! Most of you have probably seen this post – but it’s been featured on Crazy Good Parent today! Come check this fabbo blog out. There is something about laughter and physical activity that when combined together makes for one happy group. hee hee – wet sploosh balls are a kid-magnet. Thanks so much for bringing this fabulous idea to Crazy Good Parent. Maybe kids should come with round swimming pools? Wouldn’t THAT be awesome! I will always opt for a round pool – it’s so fun and affords a lot of general splashing exercise. Your son is so insightful. I am having similar struggles with my almost 11yr old daughter. We have started activities together like reading (a chapter each) to the younger kids every day. It’s helping us too. This is a difficult age I think. Can’t you damage the filter like that? With all that whirlpooling? That reminds me of this story: My sister bought a fish tank. She wanted to keep it extra clean so she bought a larger filter than she needed. She got it all hooked up, turned it on and it was so powerful that it created and whirlpool and the fist were whipped and battered around the tank. Watching her fumble to turn it off was one of the funniest things I’ve ever seen. The filter doesn’t run when we’re in the pool – it’s unplugged because, well, it’s only a stanchion pool from Target. But we haven’t ever had a problem. If we had 6 people doing fast whirlpooling every day, that would be different and would probably stress out the sides, but two or 3 people – not so bad.